Origin of name  One piece of the property that was combined to make Mullet Hall Plantation had been known as the "Mullet" tract as it had been owned by Thomas Mullet (4, p. 81). Thomas Stanyarne received a grant for 100 acres on Johns Island on November 14 (6, p. 8).
?  William Stanyarne, son of Thomas, owned the property on Johns Island (4, p. 78).
?  Peter Herne acquired a tract of land that had been owned by William Stanyarne (4, p. 78). 1788  James Legare purchased the 233 acre plantation from Peter Herne (4, p. 78). 1792  James Legare purchased at auction an adjoining 374.5 acres that had previously belonged to Alexander McGillivray (4, p. 81). 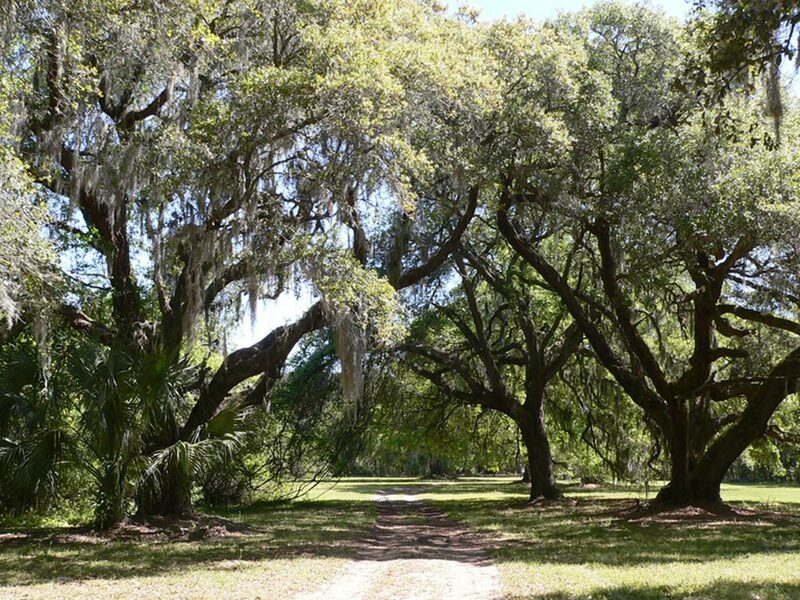 1794  James Legare considerably increased the size of his plantation by purchasing the 597 acre Mullet tract. Benjamin and Mary Matthews had conveyed the property to Mullet in 1791. It is believe a house had been on the property during the Matthews ownership (4, p. 81). At some point, James Legare began to live on the plantation (4, p. 82). 1830  Mullet Hall was divided between two of his children at the time of James Legare's death. The western section was left to James C. W. Legare which held the house and retained the name Mullet Hall. The eastern section went to his daughter Eliza Slann Wilkinson Legare who was married to Solomon Legare Jr. This section would be called Home Place (4, p. 82). 1850  James C. W. Legare died leaving Mullet Hall to his wife Lydia Ball Bryan Legare and their children (4, p. 83). 1855  Lydia purchased Rosebank Plantation and folded it into Mullet Hall (4, p. 86). 1868  Lydia passed away willing the plantation to her four children. Son Francis Yonge Legare took over management of Mullet Hall. He would build a house at Mullet Hall (4, p. 83). 1878  Solomon Legare passed away as sole owner of Home Place (eastern section). His wife Eliza had died in 1847 and he had purchased the plantation from her estate. Solomon's will stipulated Home Place be sold by his wife Amelia with the proceeds being divided among her and their three daughters. Home Place was sold to an attorney acting as an agent for the Legare family. The Home Place property was surveyed then pieces conveyed to members of the Legare family. Francis Y. Legare acquired most of Home Place and it was once again made part of Mullet Hall Plantation. Francis would go on to acquire the other pieces from his family members over the coming years (4, p. 91-94). 1897  Francis Y. Legare purchased the Oaks Plantation for $3,200 and folded it into Mullet Hall (4, p. 100). 1905  Francis died and his wife Kate continued to farm Mullet Hall using Dill, Ball Company to manage the property (4, p. 94). 1923  By this time Kate Legare had conveyed portions of Mullet Hall and acquired other properties. It is assumed she agreed to a foreclosure of Mullet Hall. Dill, Ball Company purchased the property, 1,675 acres, for $10,000 at auction. They rented most of the property to farmers (4, p. 93). 1929  Dill, Ball Company sold Mullet Hall to John Knapp Hollins. It appears that Dill, Ball Company held the mortgage issued to Hollins. Hollins retained the management services of Dill, Ball Company and the property continued to be leased to farmers (4, p. 98). 1942  Dill, Ball Company sold the 1,685 acre Mullet Hall to Julian S. Limehouse Jr. for $12,000. It is assumed Hollins had defaulted on his mortgage. Limehouse raised cattle on the property. The house built by Francis Y. Legare was still on the property at this time (3 and 4, p. 98).
?  After the death of Julian S. Limehouse Jr., the property was divided evenly among eight heirs (5). 1994  The heirs of Julian Limehouse conveyed 738 acres to the Charleston County Park and Recreation Commission and sold the other 2,207 acres to The Beach Company (3 and 4, p. 98). 2014  Kiawah River Plantation, LP, an affiliate of The Beach Company, plans to extensively develop the property.